Last update noted that we needed at least one more new high before we could consider the possibility that the rally had enough waves for completion, and we got that new high. And a reversal. And what that means is that -- while the last few weeks have been easy trading with a clear uptrend and every update ending with some version of "the rally still looks pointed higher for now" -- the easy money may be over for the moment. At least until this move clarifies a bit. This is just part of the way things work, because it simply wouldn't be fair if we knew what the market was going to do every single day. So this is the first bigger-picture ambiguity we've had in a while -- but as always, it will clarify soon enough. 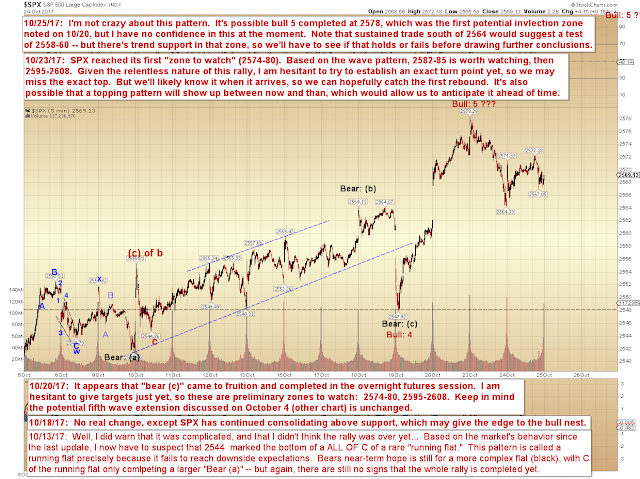 In keeping with the recent theme of the updates, we're also going to step back and look at the larger time frames via INDU. It's interesting sometimes to go back and read things from a year or more back. 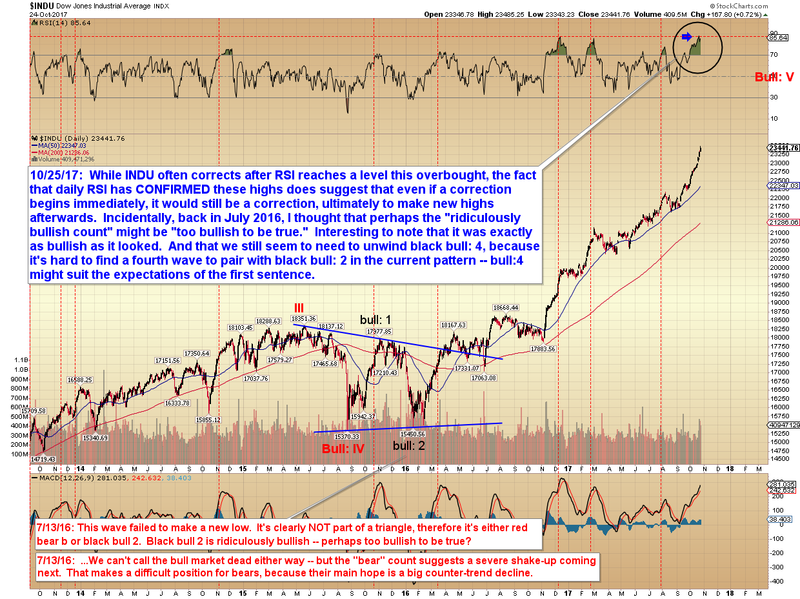 In this case, I remember thinking how bullish this chart was if black bull 1/2 were accurate, and I likewise remember having doubts that things could be that bullish immediately, though I was still firmly bullish on the long-term. 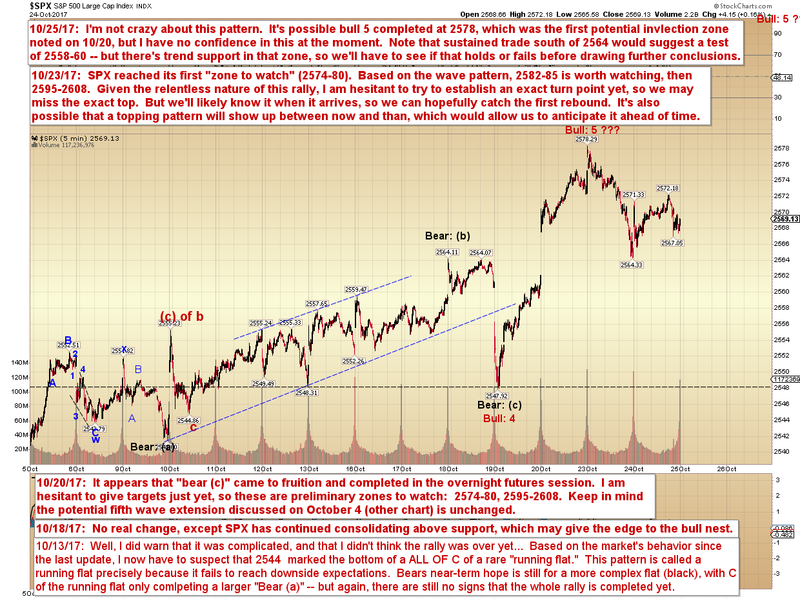 Anyway, interesting to note that the pattern was indeed "that bullish." In conclusion, INDU is overbought, and SPX does have enough waves up that a more extended correction here wouldn't be unreasonable -- nevertheless, we don't quite have enough info to commit to that idea yet. Do note that if SPX immediately sustains a breakout north of 2573, there is the potential of a bull nest, so bears might want to exercise extreme caution if that occurs. Trade safe.